The Ministry of the Environment, led by the struggling João Matos Fernandes, fresh from a further round of demolitions on the Ria Formosa islands, is perfectly OK about the building of luxury villas in the ecologically sensitive sand dunes at Galé beach. Despite this being a zone of great sensitivity, the Office of the Minister for the Environment formally has written in response to questions raised by the Communist Party and by one of its MPs, Paulo Sá, stating, “In 2010 a permit change was requested and the Portuguese Environment Agency considered that this change was compatible with the Burgau-Vilamoura Coastal Land Management Plan. “The Administration’s action is and must be guided by the principle of legality, in compliance with the law. The analysis and evaluation of any project on the coast is made in compliance with the applicable legal and regulatory standards and the coastal planning plan,” according to the ministry. The Communists and environmental organisations are astounded that despite this sensitive area of dunes needing to have a special walkway to protect the area from human impact and to prevent environmental damage, the very same area is OK for the building of multi-million euro luxury villas. The Communist Party executive has pointed out the contradiction in the Ria Formosa island property clearances, justified under a range of in increasingly desperate legal arguments, when placed side by side with the development of posh villas almost on the beach at Galé. Environmental protection and the safety of people do not seem to apply in Galé and villas can be built on sensitive dunes, close to the sea, with the ministry’s blessing as the dunes are privately owned despite, not unsurprisingly, being a stone’s throw from the sea. The Government says it’s a question of the use of private land and not land in the public maritime domain, as on the islands – except on Faro island for which it wheels out other excuses. The new coastal plan covering Odeceixe to Vilamoura was released in June 2017 and showed that two villas on the beach at Galé were to be torn down as they represented infringements into the maritime domain. The new villas, being on privately owned land, can be built. The Ministry of the Environment has proved again that it is nothing of the sort when big money from private enterprise is at risk. 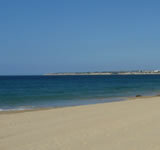 Not far from the new villas on the beach at Galé is the controversial Salgados Praia Grande development, given the environmental thumbs up by Paulo Lemos, the then Secretary of State for the Environment, who in 2013 authorised a massive, three hotel and golf course tourist development on 360 hectares of unspoiled wetland and countryside, the last such beach-facing zone left in the central Algarve – a haven for birdlife and abundant in fast-disappearing natural resources. This massive development triggered the largest non-oil environmental campaign the region has ever seen with 34,140 signatories on a Save Salgados campaign website. The Salgados Praia Grande eco-Development has had ’eco’ added to its name but fools no one as it is no more ‘eco’ than an aging V8. Due to spirited environmental opposition, this development has yet to start but its current owner, the disgraced Millennium BPC, is keen to offload its environmental hot potato to the highest bidder while refusing to answer any questions about the moral and environmental aspects of the planned wholesale destruction of countryside which its board, de facto, fully endorses.